Since the new airport, Suvarnabhumi, was opened in Bangkok in 2006 Thai Air has used both Suvarnabhumi and, the older, smaller, Don Muang airport for it’s international and domestic flights. The majority of Thai Air’s domestic flights were using Don Muang which inevitably led to confusion for international travellers that had connecting flights to domestic locations. 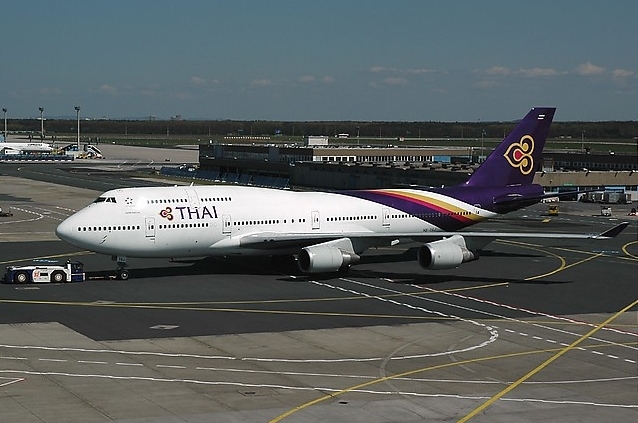 Thai Air announced Wednesday that they would be consolidating all of their flights to Suvarnabhumi, the main international airport, by April. Thai Air president Narongsak Sangapong said this move will reduce operating and management costs. Thai Air has been hit hard by last years fuel surcharge increases, the slow down of the global economy, and recent political turmoil that saw both airports shut down for a week by protesters. It’s estimated that these combined problems have cost Thai Air 5- 6 billion baht ( 144-173 million dollars ). Thai Air is also seeking 34 billion baht ( 974 million dollars ) in aid from financial institutions for working capitol and debt restructuring. Thai Air is hoping that financial aid, hub consolidation and greatly reduced domestic fares will put them back in good shape by the end of 2009. A lot of this will hinge on tourism that is way down from this time last year. If nothing else this move will help out the international passengers with connecting flights that were previously routed to Don Maung. Other carriers such as Nok Air and One Two Gp continue to use Don Muang as their domestic hub. That is great news for me. Using my regular flight route I arrive in the LOS at seven in the morning, this will give me a wider choice of flights to Udon Thani. Even better news is that previously my evening return flight involved flying to Don Muang early afternoon and grabbing a cab to Suvarnabhumi and then a 4 to 5 hour wait. Assuming the Thai Air flight times are suitable, this new service will save me a lot of time and hassle. You mention reduced air fares, that’s always welcome. The downside for Thai Air could be their hopes of tourism improving, can’t see that happening till 2010 and only providing the country can sustain a lengthy period of stability. I’m sure it will help with a lot of missed planes as well. I know a lot of people trying to make the connecting flights at Don Muang missed them in the past. Hopefully they will keep it this way and not move back when the economic picture gets better.